Last night the Blue Jackets completed a 5-game road trip through Canada with an amazing 6-0 win in Toronto. Columbus won 3 of the 5 games. Interestingly, the two losses were routs, a 7-0 loss in Edmonton and a 6-2 loss in Vancouver. So it has been feast or famine here lately. Tomorrow night the Jackets host Nashville, then have a return match with Edmonton on Friday. The men’s basketball teams had scares last night. I did not get to see Ohio State, but they were tied with Wyoming late. The Bucks ended up winning 65-50. Kentucky trailed visiting Cleveland State for most of the game, and were even down double digits at one point. But the Cats rallied and won 68-61. On Sunday, the Kentucky women went to Murfreesboro to face a Middle Tennessee State team that beat them in 2011. The Cats controlled the game, but it remained close until late before UK wrapped up an 84-72 win. Upset in Columbus, as Bowling Green came to town and beat Ohio State 64-52. The Buckeyes are still on the outside looking in, but they are standing a bit closer to the window now, after Oklahoma State’s stunning 49-17 win over Baylor. The Bears were just a fraction of a point below Ohio State in the BCS standings, and were expected to beat the Cowboys and move to #3 in the rankings. I watched a good bit of the game last night, and expected the Baylor offense to explode at any time. It never happened. Alabama will play Auburn in what could be a good game. The SEC championship game follows with a matchup with South Carolina. It doesn’t look as if Florida State will be challenged in the remaining games in the regular season. Ohio State visits Michigan, then will play Michigan State in the Big Ten championship game. Urban Meyer still hasn’t lost a game at Ohio State. After being ineligible for a bowl last year due to probation, the Bucks may be left out of the National Championship game again this year. OSU is ranked third in the BCS behind Alabama and Florida State. While there is a lot more football to be played, those two appear to be on a collision course for the championship game. Frankly, I’m not sure the Bucks’ defense is good enough to beat either the Tide or the Seminoles. Mark Stoops still doesn’t have an SEC win on his ledger at Kentucky. The Cats go to Georgia tomorrow then wrap up next week playing host to Tennessee. So there is still a chance for a signature win, but the football Cats are really a work in progress. Basketball season is off to a reasonably good start. The Ohio State women, under first-year coach Kevin McGuff, are 3-1. The lone blemish is a 4-point loss at Georgia, one of the better SEC teams. Starting tonight, the Bucks play three games in three days in the Basketball Hall-of-Fame classic. This includes a game against Marist who has eliminated the Buckeyes from the NCAA tournament in years past. The Kentucky women are undefeated and have not yet had a close game. This includes a win at Marist. The Cats will be at Middle Tennessee Sunday afternoon, a place where they have lost recently. The Ohio State men are unbeaten, including an impressive 52-35 win at Marquette. The Kentucky freshman lost by 4 to an experienced Michigan State team in Chicago. Had the Cats shot free throws better it might have been a different story. They made a nice comeback after being down big early. The Blue Jackets are 8-11-3 and tied for last place in the Metropolitan division. But there are plenty of opportunities to get back in the hunt. Road wins over Ottawa and Calgary bracketed a 7-0 blow out loss in Edmonton. The Jackets have games at Vancouver and Toronto before heading back home. College basketball season starts soon. In fact, Duke beat Drury today. Last night in an exhibition game, Kentucky beat Transylvania, a small college here in Lexington. Kentucky is ranked #1 in both the AP and USA Today/ESPN polls. Michigan State, Louisville and Duke all got first-place votes as well. Ohio State is 11th in the AP, 10th in USA Today/ESPN. With Michigan ranked higher, the pollsters expect the Buckeyes to finish third in the Big Ten. On the women’s side, Connecticut, winner of eight national championships, is nearly the consensus #1. Kentucky is #7 in the AP, and #8 in the USA Today Coaches poll. Ohio State is unranked under new coach Kevin McGuff, and will be rebuilding this year. Hockey season began with high hopes for Columbus Blue Jacket fans, after having missed the playoffs by just one standing point last year. But so far, Sergei Bobrovsky hasn’t had as good a year between the pipes as he did last year. The Jackets are 5-7-0 in the new Metropolitan division, good for sixth place out of eight teams. So far, the Metro is easily the weakest division in the NHL, so there is room for Columbus to make some noise. It looks like Pittsburgh will easily rule that division but the other teams are pretty mediocre. Fortunately, Columbus does show some goal-scoring ability now and then. After losing in Pittsburgh 4-2 last night, the Jackets entertain the Pens again tonight, looking for a win to split the series. In college football, there are still a number of unbeaten teams. Many folks hope that the regular season ends with just two unbeatens, which become the national championship game attendees. Miami and Florida State get together tonight in what could be a great game. The loser suffers their first loss of the year. Ohio State has won 21 in-a-row now. Today’s 56-0 thrashing of Purdue follows last week’s 63-14 win over Penn State. But the Buckeyes are currently fourth in the BCS standings, so will need some help to make it into the championship game. Alabama can always get tripped up somewhere in the tough SEC. Oregon visits Stanford next week in a toughie. Florida State losing tonight to the ‘Canes would help a lot. The only positive for Kentucky this year is that they have been competitive in all games except the 48-7 loss to Alabama. If Mark Stoops can keep recruiting the way he has, the Cats’ fortunes may start to turn. I’m too late to wish you a Happy Halloween. But I always set my clocks back the day before we change back to standard time. I already have that done. I just have to be sure to account for that as I look at my clocks today. The computer clocks and my atomic clocks will take care of themselves. 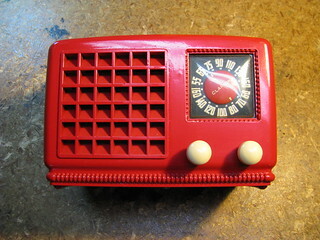 I’ve been planning for some time to get into doing some antique radio restoration work. I finally got that started in October. A friend of mine gave my girlfriend Bonnie a Clarion 146-series AM radio. The outside is in very good shape, and it is her favorite color, red. It will need a bunch of parts replaced before I can give it a try. But the major complex components seem to be OK. I will have pictures and video if I’m successful. Another activity for me in October was selling a lot of stuff on eBay. I got rid of my D-Star handheld (which I was not using) and a bunch of license plates that were surplus to my collection. Also sold some electronic stuff that I wasn’t using. The ham bands continue to be in excellent shape, and I have worked a bunch of new countries and states that I need. Uploading my October logs to Logbook of The World produced a number of new confirmations needed for the awards I am working on. On the lower frequencies (AM broadcast band) I logged eight new stations as the result of a simple two-minute recording I made with my Perseus software defined radio (SDR). I recorded from 700-1500 KHz. With a recording, you can playback stretches as many times as needed to try to discern what you’re hearing. Plus, with Perseus recordings you can change to single sideband mode, and adjust the receive bandwidth at will. It took me several hours to get through that one recording, and I have several more to do. Friday nights during the autumn are popular times for AM DXers to listen, as a lot of stations are broadcasting high school football games. Some of these may stay on the air longer than normal, or run daytime power levels longer than normal. With stormy weather expected on Halloween, trick-or-treating was moved to Friday night here. The weather was excellent, but I only had 14 kids. That compares to 30+ in the recent past. That is a lot of leftover candy I am going to have to work through. Tough job, but somebody has to do it!